When you think of Nevada, many first go to the most well known city in the whole state which is of course Las Vegas. 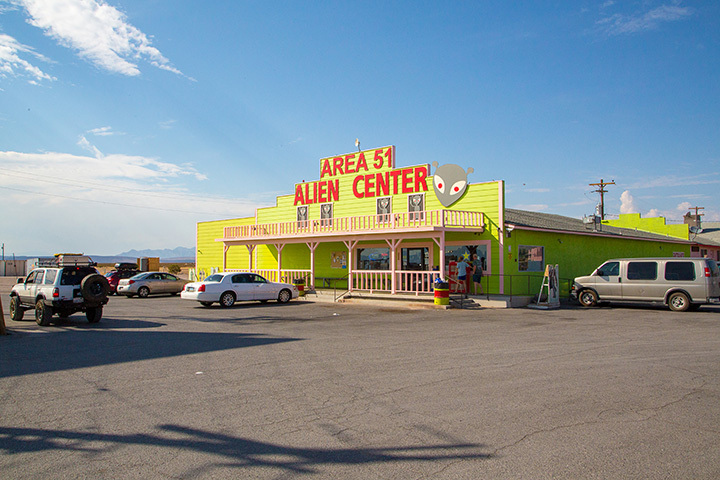 Beyond the well-known adult playground that tells no tales, Nevada holds many unusual attractions that include some that are rumored to be haunted, a few with otherworldly ties, and some things that will leave you scratching your head. Enjoy these 15 unusual attractions in Nevada. With Las Vegas having more hotel rooms than any other place on Earth, you may wonder why you would venture beyond the city limits to this out of the way spot. This is not a motel for the luxury traveler or the weak of heart. This is the place for a once in a lifetime experience. The motel with high marks for the creepy factor has been featured on “Ghost Adventures” and often delivers far more of an adventure than some guests are prepared for. Located in Tonopah, it is a bit of a drive but worth it just for the bragging rights for guests who stay the full night. Only in Las Vegas will you find a piece of history right above the urinal in the men's room. At the Main Street Station Casino in downtown Las Vegas men (and women if the men’s room isn't occupied) can catch a bit of history as they relieve themselves so to speak. An actual section of the wall has been transported to it's forever home in this unlikely place for all to enjoy. There has been a lot of speculation as to where the car that Bonnie and Clyde died in ended up due to there being several counterfeits as well as a few props made for movies, but the real deal has found a home at Whiskey Pete's Casino in Primm, Nevada. This car is the actual V-8 Ford that this unlikely pair stole for their crime spree and would end up with 100 bullet holes in it. The small museum also houses Clyde's death shirt as well as another famous crime related vehicle, a car once owned by gangster Dutch Schultz. At first glance this may seem like just another sporting goods store, but this flagship store is an experience beyond a regular shopping trip. The store includes an indoor Ferris wheel, animatronic tributes to American presidents, a mouthwatering fudge shop, huge collection of tropical fish and a scaled indoor mountain to test your skills on. There is also a set of midway type games and other entertainment options for the whole family. Everyone dreams of running into their favorite star for a quick selfie on vacation, and this is just the place to do that! This lifelike wax museum offers a hands-on tour experience that not only makes the perfect photo a reality, they encourage it. Where else can you rub elbows with red carpet ready Angelina Jolie and also pretend to appear with famed TV host Jerry Springer? While there may be other wax museums, this is the only one that is said to haunted in it's current location. Rumor has it very spot once hosted Vegas royalty that still visit to this day. In a city famous for all sorts of weddings, nothing compares to the drive up window at the Little White Chapel in Las Vegas. Forget walking down the aisle or even leaving your car, you can make tying the knot as quick as getting take out for dinner tonight. The Tunnel of Love has welcomed a host of celebrities and is a quirky must visit spot on any trip to Las Vegas. Ash Meadows Wildlife Refuge is truly an oasis in the desert, outside of Las Vegas by about 90 miles. This unique natural habitat has something for everyone. The animals and insects here are some of the most unique and some only exist in this location. Beyond the last place on earth so see the pupfish, there are also some long abandoned stone cabins from the wild west to be explored. It is very much a once in a life time chance to see something you will only find in the high desert of Nevada. Container Park in downtown Las Vegas is quirky, eclectic and bordering on a bit of “Burning Man” wrapped into a small shopping and dining complex made out of reclaimed shipping containers. The center of this funky spot where you can shop small local vendors, the kids can play in a desert tree-house and dine on some of the best food in Las Vegas is a giant praying mantis. At 55 feet-tall, the Praying Mantis sculpture would attract enough attention on it's own but the fire breathing element takes it to the “Burning Man” level. Virginia City is known for it's rich mining history and this includes a few must see spots that may leave visitors with more questions than answers. While many mines are located in out of the way spots, one of the more well known mines in Virginia City is actually located right under a Saloon! Tour a hidden mine and also take a detour to another local hot spot rumored to be haunted by some of the very miners at the Silver Queen. The Silver Queen is widely reported as being haunted and is home to the 15 foot-tall portrait of the “Silver Queen” that is covered in 3,200 silver coins. When you think of Nevada, dolphins may not be the first thing to come to mind and painting with them may never come to mind but at the Mirage in Las Vegas you can find both. In the Secret Garden guests are able to do something you wont find anywhere else, not only get up close to these amazing creatures but paint something pretty amazing to take home as well. The art as you can imagine is a bit abstract but the chance to paint with a dolphin is something worth doing the next time you are visiting Las Vegas. Many unexplained things happen in the desert of Nevada, some of which has historical significance including the atomic bomb testing. This national museum offers a glance into some of the major testing done under cover of the desert isolation as well as exhibits from a government perspective on Area 51. This hands-on museum offers visitors the chance to see some interesting history. Touring Hoover Dam is a breathtaking experience on it's own, but for a bit of history off the beaten path also be sure to visit the Toilet Paper Hero sculpture in Boulder City. This ode to the 1930's janitor Alabam who cleaned the outhouses for all the dam workers is an interesting nod to a different time. A tour to see the inside workings of the dam and often untold facts about construction is also a must do for a visit to Nevada. If the walls of this unique museum could talk they would have plenty to say. The museum is located in an old courthouse that has seen many trials related to the well known organized crime families in Las Vegas. This museum offers a no holds barred glimpse into the not so distant past of both law enforcement and organized crime in old Vegas. The museum is home to some major interactive exhibits as well as hosting traveling exhibits that include topics like motorcycle gangs, and the Mob in America. The tours transports visitors back in time. While getting married in Las Vegas may not seem all that unusual, getting married on a roller coaster in Las Vegas sure is! The Big Apple Coaster at New York, New York offers the average thrill ride fan the chance of a lifetime in the opportunity to not only scream your heart out but also commit your heart to your true love in a wedding via the coaster. This takes the idea of a quick Vegas wedding to the next level as you and your guests speed towards married bliss over the course of the high speed ride.